When this page was originally written – some time in 2006 – ARM7 processors were all the rage. I wanted at the time to document some of the boards then available. Of course, now those boards are all essentially obsolete. ARM’s Cortex-M architecture is smaller and more efficient – though the instruction set, at least for the ARMv7-M variants (Cortex-M3 and -M4) is pretty darn complicated. I’m leaving, for history’s sake, the images and links on this page. 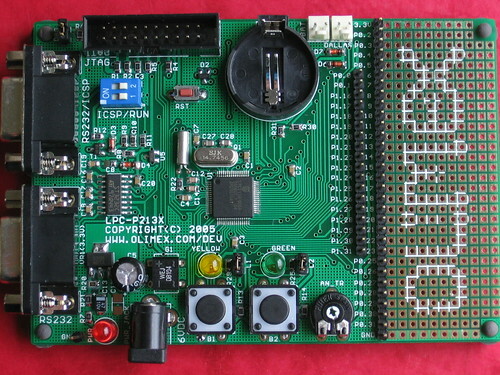 But for current and future development, you would be much better served by looking at an ARM Cortex-M development board. 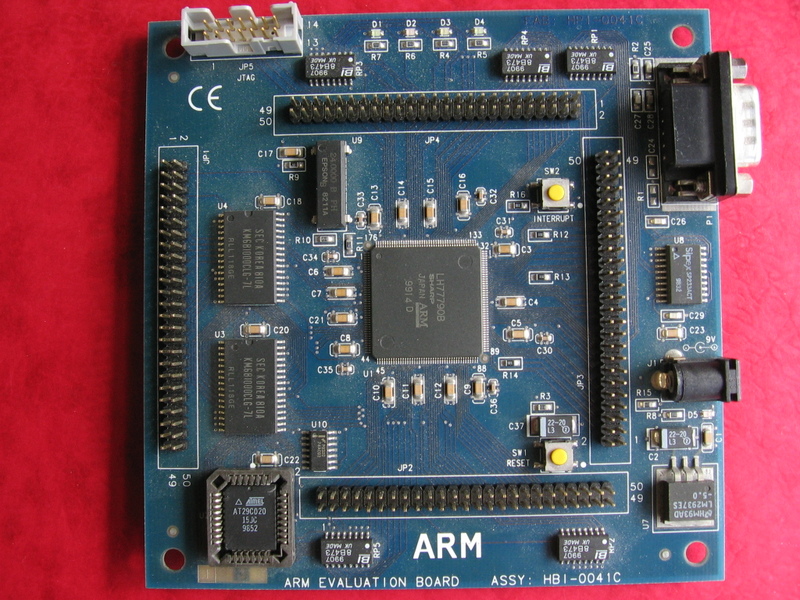 a Sharp LH77790 (ARM 7DI core), 24MHz processor (center). 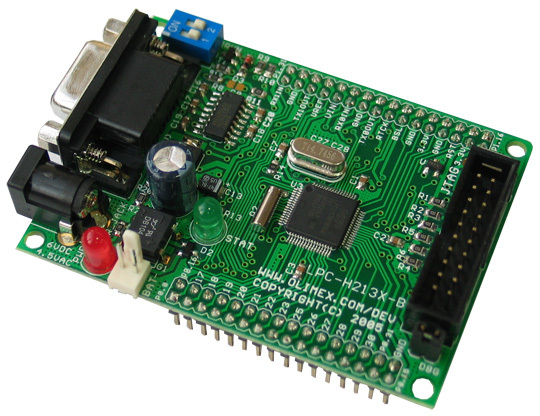 The processor has counters/timers/PWM, 2 serial ports, a watchdog timer, LCD interface, but no A/D or D/A. And, worst of all, it has only 2k of SRAM on chip (and a 2k cache); and because it has only a 16-bit-wide external bus, memory access, and therefore execution, is slowed. It’s real hardware though, and I’ve been able to use it to test my Forth code. Now there are nicer choices, of both board and CPU. 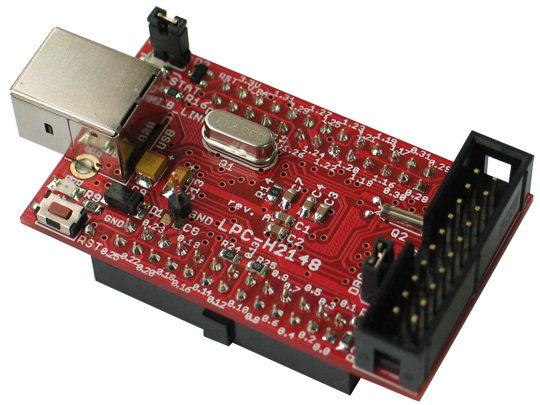 I’m excited about the Philips LPC2000 series of small, ARM7TDMI-based microcontrollers. They are tiny, fast, cheap ... and out of control! single 10-bit D/A converter (LPC2132/34/36/38). It’s rather small: only 120mm x 80mm! 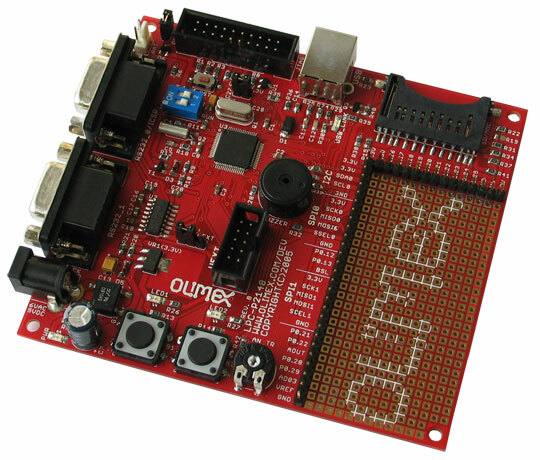 All these Olimex boards are available from Sparkfun.